These titles get better and better. 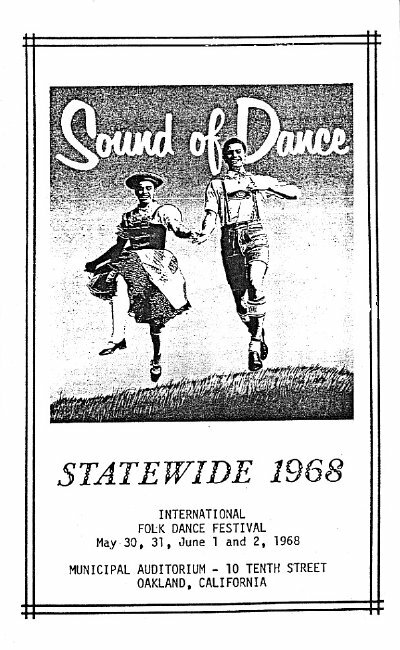 For example, Oakland's "Sound of Dance," and it would be in my home town that we held the 1968 Annual Statewide Festival, May 30, 31, June 1, and 2. 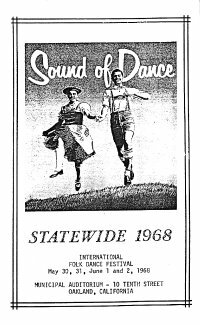 Taking a page from Long Beach's program, Northern President, Bill D'Alvy, as a front piece to Oakland's program, welcomed Alice Hauserman, president of the South and all Southern folk dancers, along with folk dancers from everywhere, to Oakland's "Sound of Dance," and the 23rd Annual Statewide. The Leamington was the host hotel, located right in downtown Oakland, and if you reached there to register early on May 30, you discovered that a Picnic was in progress from 10:00 a.m. until 5:00 p.m. out at the Meadows in Joaquin Miller Park and I'm not sure who furnished the hot dogs. Then, if your strength held up, there was dancing 8:00 p.m. to 12:00 midnight in the Leamington. Another innovation Friday was lunch and dancing at Peluso's Restaurant from 1:00 p.m. until 5:00 p.m. or a sightseeing tour if you preferred. But then we dined at Peluso's again between 5:00 p.m. and 7:00 p.m. prior to the Institute at the Leamington with more dance following. Goodbye, Mr. Peluso. Saturday afternoon it was dancing at the Oakland Auditorium and, unlike 1952, we fit into its huge interior comfortably. But we were looking forward to the 8:00 o'clock Concert, also in the Auditorium. That beautiful program, presented as we entered, kept us busy until the lights were dimmed. The program, A Symphony In Color, should have remained a souvenir for years to come--mine has. As to the show, it measured up and those who participated in arrangements as well as on the floor had a right to feel proud. None other than Millie von Konsky would have been considered for the job of Director/Producer. During the dancing that followed, most conversation centered around the performances that had just taken place. The huge Auditorium has many rooms and the Balkan After Party found the ballroom quite suitable so they danced from 10:30 p.m. until 3:00 a.m. But not to be outdone, the general folk dancers held a Hofbrau Party in the Leamington, dancing from 1:00 a.m. until 3:00 a.m. If the 23rd Statewide had ended right here it would have been considered a big success but Sunday afternoon, June 2nd in the Auditorium, there was a Festival and a Costume Show, then more dancing until 6:00 p.m. But we mustn't forget the Sunday morning Installation Brunch at the Leamington and the special program for the affair, now a must. The Past Presidents this year made page one. All outgoing and incoming officers were listed as were dates and places of previous Statewides. Some of the people who had a hand in the forming and running of this fine show were, as usual, Nate Moore, who narrated the Concert; Script, Liesl Barnett; Publicity, Frank Kane; Dance Program, Bernice Schram; Costume Parade, Althea Libersky; Picnic, Eldon Kane; Masters of Ceremony, Ann D'Alvy; Squares, Stan Valentine; Institute, Bobby Burk; and a host of others. The "Sound of Dance" sounded good and will keep us happy for another year.